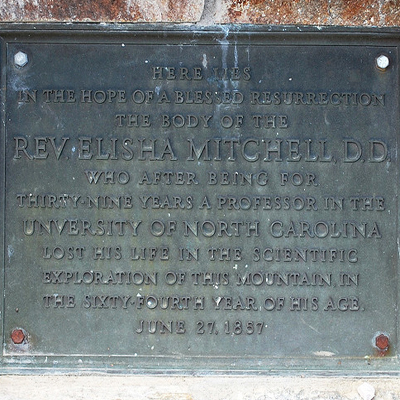 A bronze plaque set into a stone cairn marks the grave of the Reverend Elisha Mitchell who is credited with identifying Mt. Mitchell as the tallest mountain east of the Rocky Mountains. The cairn is surrounded by loose rocks and an outer retaining wall. The grave is located on the summit of Mt. Mitchell near the observation tower built in 2009. The cairn as it appears today was rebuilt at the same time using smooth stones. The cairn put in place at the time of Mitchell’s burial was made of loose stone and prone to vandalism. In 1926 during construction of a stone observation tower the cairn was redone using rough stone and concrete and surrounded by an iron fence. A temporary marker was used until the same bronze marker in place today was dedicated in 1928. HERE LIES / IN THE HOPE OF A BLESSED RESURRECTION / THE BODY OF THE / REV. ELISHA MITCHELL, D.D. / WHO AFTER BEING FOR / THIRTY-NINE YEARS A PROFESSOR IN THE / UNIVERSITY OF NORTH CAROLINA / LOST HIS LIFE IN THE SCIENTIFIC / EXPLORATION OF THIS MOUNTAIN IN, / THE 64TH YEAR OF HIS AGE. / JUNE27, 1857. The original 1888 12 ft. tall Elisha Mitchell obelisk had been destroyed by strong winds in 1915 leaving his grave marked only by a stone cairn. A wooden temporary marker stood at the head of the cairn until the new memorial was dedicated in 1928. The first lookout tower on Mt. Mitchell was built in 1916 and replaced by a stone tower dedicated in 1927 with funding from C.J. Harris of Dillsboro. That tower was replaced in 1959. In 2009 a handicap-accessible observation deck replaced the 1959 tower. It was dedicated on May 9, 2009. Today the grave and overlook are in Mt. Mitchell State Park.